Speculative specifications for Microsoft's Kinect have been released by a U.K. retailer, suggesting that the device will be limited to a maximum of two "active players" at a time. 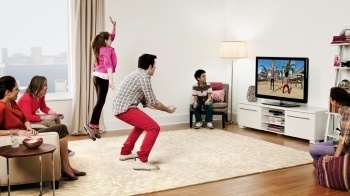 E3 has come and gone and yet we still don't know much about Kinect, Microsoft's motion controller for the Xbox 360. We don't even know how much it will cost. But we do now "know" the device's technical specifications, or at least what U.K. retailer Play.com claims are the specs, with the caveat that the information "is based on specifications supplied by manufacturers and should be used for guidance only." Of particular interest is the fact that Kinect will apparently only track two "active players" at a time. Microsoft has never specified how many people the device could support simultaneously but in a June 2009 interview with Eurogamer, Project Director Alex Kipman implied it could do more, saying, "We can track up to four players in the same way we track four controllers," he said. "Each individual player will be able to choose - do I want to bind with a controller, or do I want to bind with my body, or do I want to bind with both?" I'm not really sure what to think about it. A two-player maximum sounds a bit limiting for a device that, out of the gate at least, will likely be positioned as primarily for social, party gaming, but four people playing a movement-based videogame while crammed in front of a single screen could get chaotic in a hurry. Then again, that might be part of the fun. Regardless, like the $149 price point, these specs didn't come straight from the Microsoft mouth and thus aren't official, so take it for what it's worth - and stay tuned.